Tells the story of Robert Moses, the single most powerful man in New York for almost half a century and the greatest builder America (and probably the world) has ever known. Without ever once being elected to office, he created for himself a position of supreme and untouchable au... read full description below. The Power Broker by Robert A. Caro is a riveting and timeless account of power, politics and the city of New York by the greatest political biographer of our times. (Sunday Times) chosen by Time magazine as one of the 100 Best Non-Fiction Books of All Time and by the Modern Library as one of the 100 Greatest Books of the Twentieth Century. Now also a Sunday Times Bestseller. 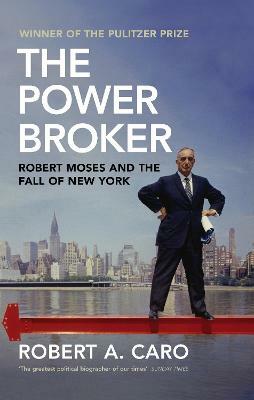 The Power Broker tells the story of Robert Moses, the single most powerful man in New York for almost half a century and the greatest builder America (and probably the world) has ever known. Without ever once being elected to office, he created for himself a position of supreme and untouchable authority, allowing him to utterly reshape the city of New York, turning it into the city we know today, while at the same time blighting the lives of millions and remaining accountable to no one. First published in 1974, this monumental classic is now widely acknowledged to be one of the greatest books of its kind. Robert A. Caro has been described as 'the greatest political biographer of our times' (Sunday Times) and 'a world authority on the nature of power and how to use it' (Guardian). His first book, The Power Broker, won the Pulitzer Prize in biography and the Frances Parkman Prize of the Society of American Historians. His subsequent books comprise a multi-volume work, The Years of Lyndon Johnson, 'regarded by many as the greatest political biography of the modern era' (The Times), winning three National Book Critics Circle Awards, the National Book Award and a further Pulitzer Prize. In 2009 he was awarded the National Humanities Medal by President Barack Obama, the highest award in the humanities given in the United States. He lives in New York City with his wife, Ina, an historian and writer.